Recently I’ve seen several interesting conversations about ad blocking, and I wanted to remind people about a great offering called Google Contributor. With Google Contributor, you contribute a certain amount of money each month. 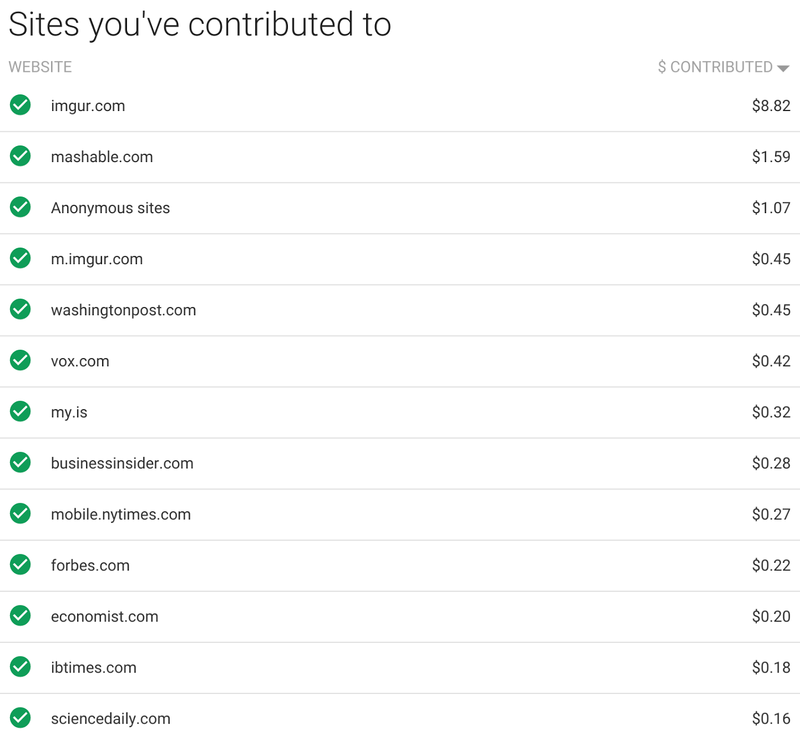 That subscription means that you see fewer ads on the web, and you support the sites that you visit with your money. 1. You support the sites you visit without expending any energy. 2. You see fewer ads. 3. (And this is the cool part) you get to decide what to show in that ad space instead of ads. But here’s the part I love: when you sign in, click the gear icon and then “Advanced settings,” and at the bottom of the page you can provide any custom URL you want (it does have to serve over https). You could replace ads with pictures of kittens, or your family. Or make ads your todo list, or a reminder to get back to work. Think outside the box, like Paul Ford. It’s the open web–you can have all kinds of fun with your HTML. Q: I thought Google Contributor only worked with ten websites or so? A: No, it works with millions of websites. Contributor launched with a small set of websites initially, but if a website runs Google ads like AdSense or DoubleClick for Publishers, it’s likely to be compatible with Contributor. Q: Isn’t there a waitlist to join? Or I need an invite or something? A: Not anymore! You can sign up immediately and support tons of websites with one monthly payment. Q: Can I see which websites I’m supporting? Q: Why don’t you support Google Apps accounts? I thought it only worked with Gmail accounts? A: This is very fresh news, but I believe Google Apps accounts are now supported. Try it out! Q: Why doesn’t Contributor support country X or currency Y? A: It’s safe to assume that the Contributor team has heard that feedback. I’m happy to pass that feedback on as well. That can be a complicated issue though. If you like the web and use it as much as I do, why not support some of your favorite websites while reducing the number of ads you see? Give Google Contributor a try now. This “hairball” post about Cuil isn’t really snarky, so I’ll post it. Cuil is no longer around, but it did spawn a funny post on Reddit about Cuil Theory. Where do those categories come from? Most people didn’t drill down that far, but it’s quite doable to figure out. If you want, take a few minutes to see if you can puzzle out how the categories are generated before reading on. Google OS figured it out, for example: “Another interesting idea is the explorative category section that shows related Wikipedia categories and topics.” With a little work, it’s easy to verify that the right-hand box comes from Wikipedia category pages. For example, the string “matt cutts” occurs on the Wikipedia page for search engine optimization, and that page also includes a link to a search engine optimization consultants page. 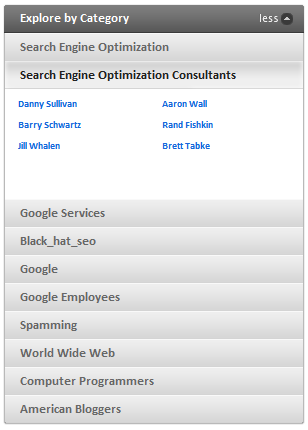 Sure enough, one of the categories listed for [matt cutts] is “Search Engine Optimization Consultants” and the entries under that category are from Wikipedia. Likewise, I think the Wikipedia page for Traffic Power and its link to a category page for black hat SEO probably accounts for why the category “Black_hat_seo” appears for my name. And this Wikipedia page has the string “p2pnet.net” and also has a category page for “Project Gotham Racing series”. The idea of surfacing Wikipedia category pages will have advantages and disadvantages depending on the user and the query. SOPA galvanized the tech community, from start-ups to venture capitalists to the largest web companies. SOPA was an unexpected shock and a wake-up call. Well, guess what? Now the internet is awake. And I don’t think it’s going back to sleep any time soon. We might need to rally again in the near future, but we can do that. The internet learns fast. Now it’s time to rally and get loud. It’s time to call your Senators. Heck, it’s time to ask your parents to call their Senators. If you think the internet is something different, something special, then take a few minutes to protect it. 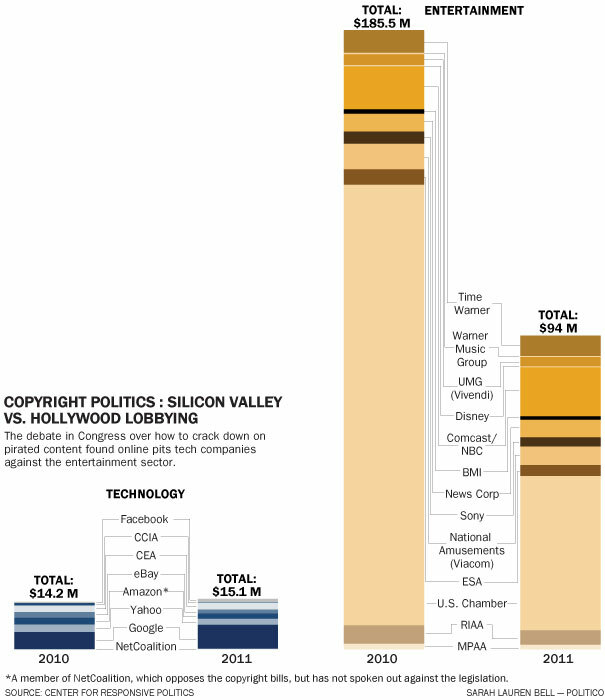 Groups that support SOPA have contributed nine times more money in Washington D.C. than our side. We need to drown out that money with the sound of our voices. I’d like to flood every Senator’s phone, email, and office with messages right up until January 24th. If you need a quick refresher about why the Stop Online Piracy Act (SOPA) and PROTECT IP Act (PIPA) are horrible ideas, Google did a blog post talking about how SOPA and PIPA will censor the web and won’t stop actual pirates. Or read about how capricious takedowns can cause serious collateral damage. Find out how real, legitimate companies can be run out of business. It’s time for action. Call your Senator right now. Spread the word to your friends and family. Promise not to vote for politicians who support SOPA. Print out some PDFs and post them at work or on your campus. There’s also protests and meetups happening today in New York, the Bay Area of California, and Seattle. Don’t live in the United States? You can still petition the State Department at americancensorship.org. This is it. You want to look back months from now and know that you did everything you could to protect the internet. Call your Senators, educate your friends and family, and please spread the word about PROTECT IP and SOPA as widely as you can. This internet censorship under SOPA editorial by Rebecca MacKinnon also describes why SOPA would be really bad for the internet. – On the Senate side, Maria Cantwell, Jerry Moran, and Rand Paul all came out against PROTECT IP. – Sandia National Laboratories, a part of the U.S. Department of Energy, concluded that the SOPA legislation would “negatively impact U.S. and global cybersecurity and Internet functionality.” Sandia joins Republican Representative Dan Lungren, who also worried that SOPA would undercut efforts to secure the internet with DNSSEC. – Tumblr made it easy for anyone to call their representative, resulting in over 87,000 calls to Congress. If you haven’t called yet, this page on Tumblr makes it easy to call your congressperson. – SendWrite offered a way to send a physical letter to Congress. SendWrite eventually had to put on the brakes after over 3000 people submitted letters to send. I think this overreach on SOPA will actually make the internet community much stronger. Let me tell you why. And members of Congress are not always the most tech-savvy: the Congressional Research Service tallies only six engineers in Congress. But if you look further out, the picture is quite different. In 20-25 years, a generation of “digital natives” who grew up with Facebook/Twitter, search engines, and cell phones will start entering Congress. The digital generation will protect technology like the internet from especially bad regulation. They’ll protect technology because they grew up with it and embrace it. So if we can make it through the next 20-25 years, the people in power will protect technology for us, not fear it. At least, I thought we’d have to wait 20-25 years before a critical mass of people would defend the net. But SOPA has brought that day a lot closer. SOPA galvanized the tech community, from start-ups to venture capitalists to the largest web companies. SOPA was an unexpected shock and a wake-up call. Well, guess what? Now the internet is awake. And I don’t think it’s going back to sleep any time soon. We might need to rally again in the near future, but we can do that. The internet learns fast. – Sign up at American Censorship to send a note to Congress and get updates. – Call your congressperson with Tumblr’s easy web page. – I believe anyone inside or outside the United States can sign this White House petition. If you’re outside the United States, you can also sign this petition. – Follow groups like the Electronic Frontier Foundation (EFF) on Twitter. – Sign up with United Republic, a new organization dedicated to the larger problem of money in politics. – Sign up to have Senator Ron Wyden read your name on the Senate floor when he filibusters against this legislation. Which charities do you donate to? Each year I like to ask what charities people are donating to. There’s still a couple days left in 2010, so I wanted to ask readers about their charity or non-profit giving. charity: water brings clean, safe drinking water to people in developing nations. The Poynter Institute is a school that trains journalists and would-be journalists, both in person and online. The Committee to Protect Journalists defends press freedom and the rights of journalists to report the news world-wide without fear of harm. MAPLight.org provides tools and data to investigate the influence of money and politics. The Sunlight Foundation focuses on using technology to make government more transparent and accountable. I don’t think I’ve mentioned my Mom’s charity on my blog before, but I did donate money this year to it, so it seems appropriate to mention it. Blessing Hands provides scholarships and other help to students in China. Side-note: in the same way that I don’t accept gifts or free things, if you ever decide to donate any money to Blessing Hands, please don’t tell me; I wouldn’t want a donation to create the appearance of any conflict of interest with my job. The Electronic Frontier Foundation (EFF) defends everyone’s digital and online rights. The EFF has stopped more bad ideas online than I can even count. Those were the organizations that I ended up giving some money to. Now it’s your turn. What charities would you like to mention, support, or call out? By the way, I’d still like to find 501(c)(3) organizations with low overhead costs that support open-source software. And I’d still like to find an organization that teaches the basics of journalism online for free. The training could cover the history of journalism, research and fact checking, ethics, legal principles, rights, how to investigate, libel and slander, off the record vs. on background, and so on. Sort of like The Khan Academy, but teaching journalism. If anyone knows of such organizations or non-profits, please leave a comment!